It's officially Fall, my favorite season! I love the cooler weather and what I adore more are the beautiful colors that are incorporated into fashion during these months. In recent runway shows, designers introduced some of the top trendy colors for Fall 2011. Take a look at a few of my personal picks below. 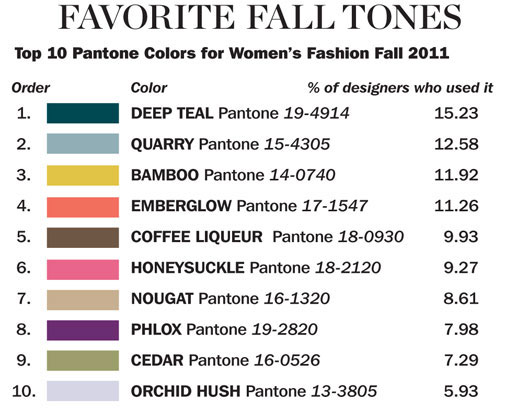 Below are the top 10 most popular colors used by designers for their Fall 2011 Collections. What will be some of your go-to Fall colors?